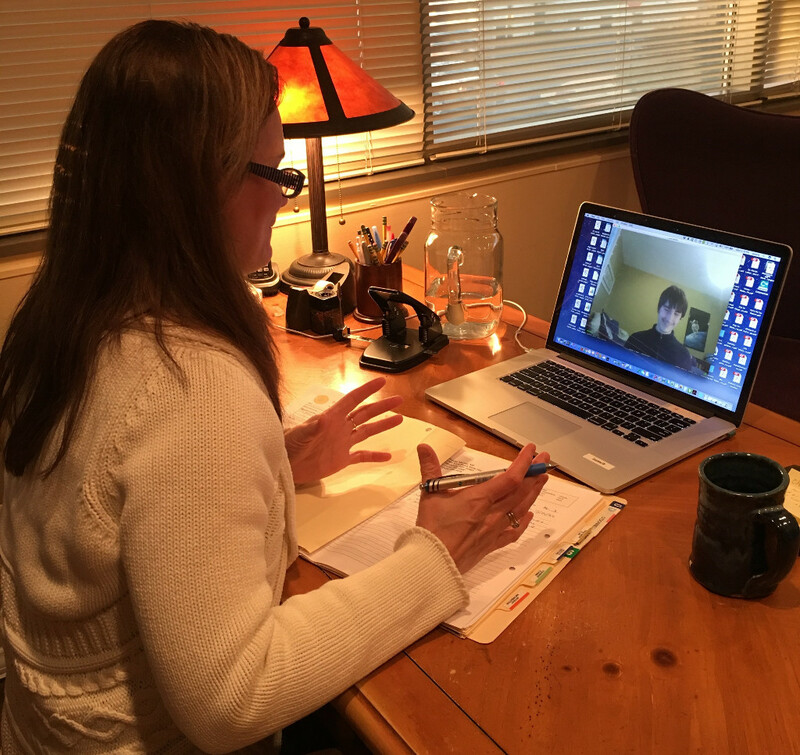 FACE to FACE APPOINTMENTS…REMOTELY ! We’ve just made it even easier for you to take care of yourself this holiday season and all through the New Year ! Now you may find quality face to face Naturopathic medical care without even leaving your home over a secure HIPPA complaint interface ! Call our office to find out more and to schedule your first or follow-up appointment. This time of year it is so easy for us to find ourselves pushed to our limits by whatever our individual circumstances may require. Two supplements that have made a a huge difference for many patients, my family and myself included are Opti Biotic & Inner Defense. If you are interested in why theses products work so well and how we can specifically support our immune system then keep reading. If not just scroll down to the photos below to see what you need now to significantly increase your odds of staying well through the holidays and beyond. Our immune system, granted, is very complex but fascinating. Below I have simplified the main methods of which supplements and nutrients protect us and restore our sense of comfort and well being. First, you will be exposed, a little or a lot, to both viruses and bacteria this winter. Make sure to minimize your vulnerabilities when you are exposed by following the 5 recommendations below. Some of the most important factors are “common sense” habits that can be easily overlooked this time of year but can make all the difference. 2. KEEP MOVING – 15 – 20 min /day of some activity that gets your blood and lymph circulating and boosts immune defenses. 3. LAUGH – Humor really is the best and most profound medicine. The endorphins that begin circulating with laughter are scientifically proven. You will feel the difference right away. Leave your anxieties and To-Do lists aside for a few moments or longer every day. Go look up some funny pins online if nothing else. It‘s a great way to lighten your day. 4. SLEEP – Get at least 8 hours /night allowing crucial cell regeneration and growth hormones to peak. Rest is your one of the most the imperative factors in maintaining or regaining the ability to withstand stress. Sleep is even anti-inflammatory ! 5. GRATITUDE – Make it a point to remember the people and things that you are most grateful. It is impossible to be both miserable and grateful at the same time. Now on to the 3 ways immune supplements help. 1. 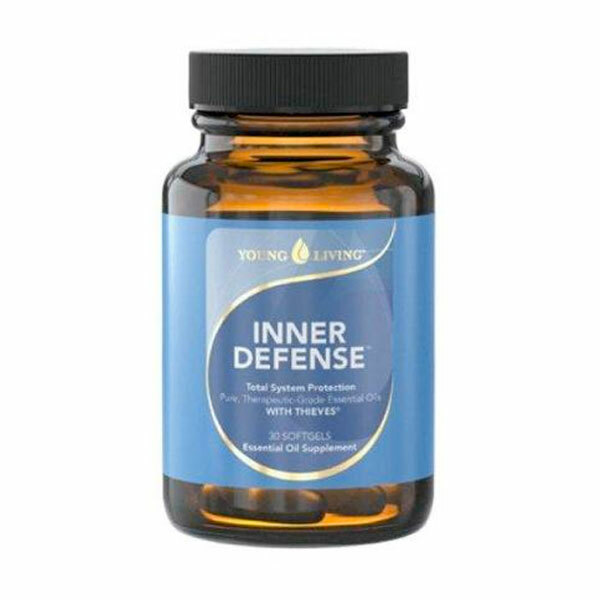 Restore & protect from potential nutrient deficiencies like vitamins and minerals that are crucial aids in multiple immune protective reactions to keep our defenses intact. A great example is Vitamin A, B vitamins, Vitamin C, Vitamin D, magnesium, zinc, bioflavonoids. These work synergistically to maintain our healthy gut and respiratory mucosal membranes, which are our barriers from the outside world. 2. Support immune balance of TH1 & TH2. Herbs like Echinacea, which are anti-microbial as well as known to support a timely coordinated response of a team of immune cells, which work together to effectively find and destroy bacteria and viral invaders. 3. The antimicrobial effects of highly volatile substances found in essential oils are like bringing in reinforcements for our immune fighting cells. When our immune cells get overwhelmed by shear numbers of bacteria or viruses either due to a huge exposure from sharing air and close contact with coughing, sneezing, fatigued people in an airplane or because we have failed to pay attention to the first list above. That’s it for now. I sincerely hope you put these recommendations to use as they can make all the difference in your world. Thank you for letting all of us at Sunlight Natural Health be a important part of your wellness strategy. 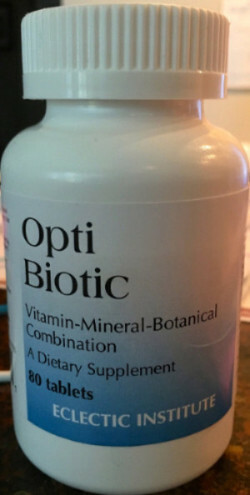 Opti Biotic is a unique combination of vitamins, minerals, and herbal ingredients specifically chosen to naturally enhance the body’s immune defense mechanisms. It features high potency vitamins A and C, Zinc, and Fresh Freeze-Dried Echinacea and Garlic. The bottles dosage descriptions for prevention of illness as well an acute condition are well described. With all of the recent news stories driving home the importance of safe water, filtration in today’s world is truly essential. Multipure is the #1 certified NSF filter and reduces one of the broadest range of contaminants of any certified filter—NSF Standard 53 (Health Effects): Lead, Mercury, Cysts,Chlorine & Chlorine by-products, Chloramine (a mix of chlorine & ammonia), Herbicides, Pesticides, Volatile Organic Chemicals, Asbestos, Arsenic. And has recently been certified for emerging Contaminants which include some prescription/OTC drugs, new types of herbicides and pesticides, chemicals used as flame retardants, and detergents which have been found at trace levels in drinking water. 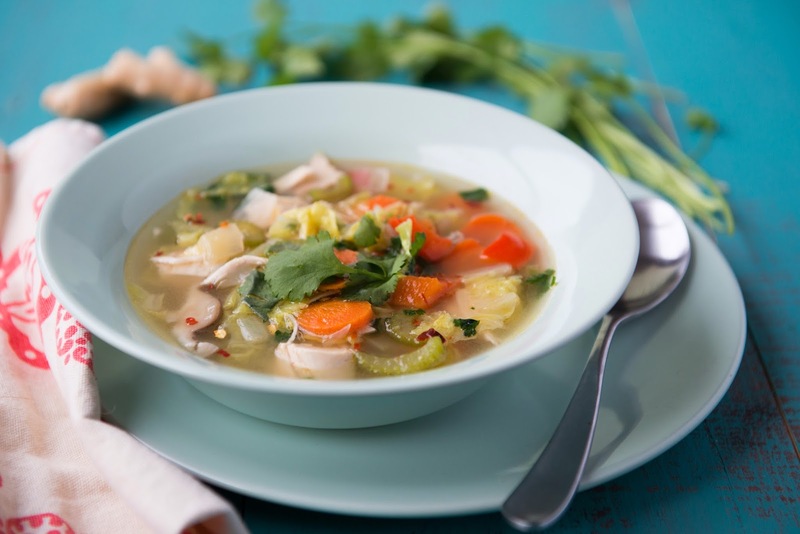 This is one of my favorite soups to make during cold and flu season. Feel free to add any vegetables you prefer. Diced yams or winter squash are an excellent addition, so are finely chopped hot peppers. You can also replace the napa cabbage with either green or savoy cabbage. Tip: Use 16 cups of water for a 4- to 5-pound chicken or 12 cups of water for a 3- to 4-pound chicken. To start making the soup, add all ingredients for the broth into an 8-quart stockpot, cover, and simmer for about 1 ½ to 2 hours on low heat. Place a large colander over another 8-quart pot or large stainless steel bowl. Pour the broth through it to strain out the chicken and vegetables. Place the pot of broth back on the stove. Place the chicken onto a plate to cool. Bring the broth to a boil, add the all of the ingredients for the soup except the napa cabbage and cilantro. Cover and simmer for 15 to 20 minutes. While the vegetables are cooking, pull all of the meat from the chicken and cut into smaller pieces. Add the chicken to the soup. Once the vegetables are tender, turn off the heat and add the chopped cabbage and cilantro. Taste and adjust salt and seasonings if desired. Bharati Devakota is an experienced classical homeopath certified in classical homeopathy & a licensed clinical professional counselor in the state of Maryland. Bharati has 10 years of clinical experience working with children to adults providing homeopathic support for minor ailments to chronic health conditions. Her clinical expertise in mental health and homeopathy brings a integrative approach for the greatest benefit. Bharati also provides independent Homeopathy & clinical therapy services as desired. Karen Shavin is a licensed massage therapist who offers custom massage utilizing Swedish, deep tissue, myofascial release, craniosacral therapy, lymph drainage therapy, Feldenkrais, and energetic techniques to help reduce stress, promote relaxation and relieve muscular pain. Mary Steinke is a Licensed Massage Therapist who brings intellect, intuition, and hands-on experience to her massage therapy practice. Mary understands that wellness has different meanings to different people, and she embodies that philosophy by offering a variety of modalities to help you focus on your goals. She integrates various principles in yoga/movement, energetics and Thai massage methods. She is certified to teach VaiHayasa Aerial Yoga and Acroyoga. She brings her real world experience of being a business woman, momma bird, world traveler, and devoted yogini to the treatment room. Copyright © 2016 Sunlight Natural Health, All rights reserved.